Domestic tank and SPG designs took a downturn in post-war Czechoslovakia. The cause of this was more technical than political. Czechoslovakian engineers could not keep up with the changing requirements of the Czechoslovakian military. 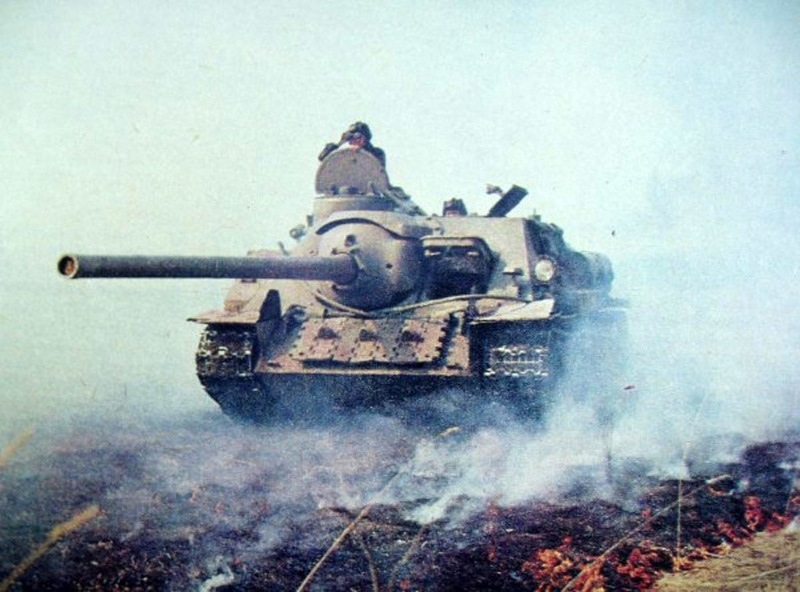 As a result, Czechoslovakia began licensed production of T-34-85 tanks in September of 1951. A similar situation took place with medium SPGs. 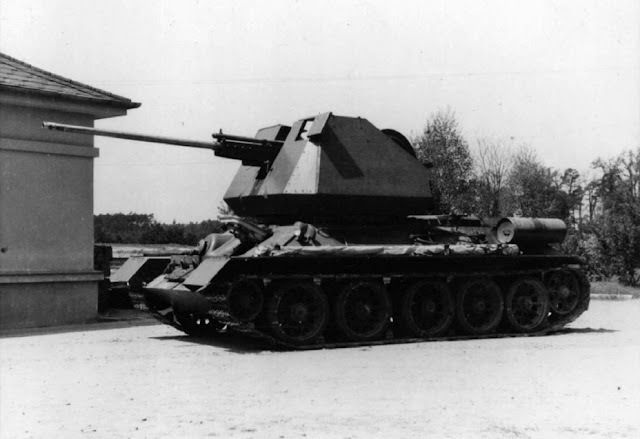 Just under 800 SD-100 SPGs, licensed clones of the SU-100, were built. By the end of WWII, the Czechoslovakian army possessed a number of Challenger tank destroyers. These vehicles, as well as 188 Cromwells, were a leftover from the 1st Czechoslovakian Armoured Brigade. 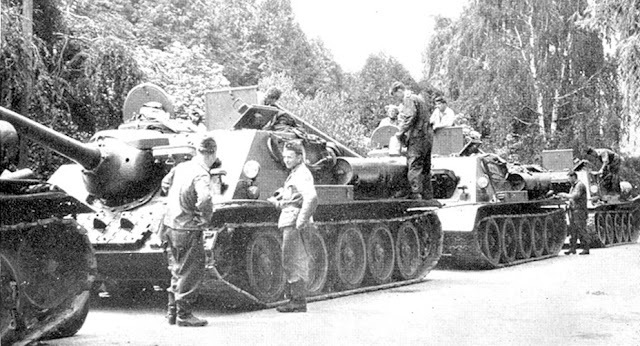 The 1st Czechoslovakian Army Corps also had two SU-85s as of May 9th, 1945, but by July they disappeared. 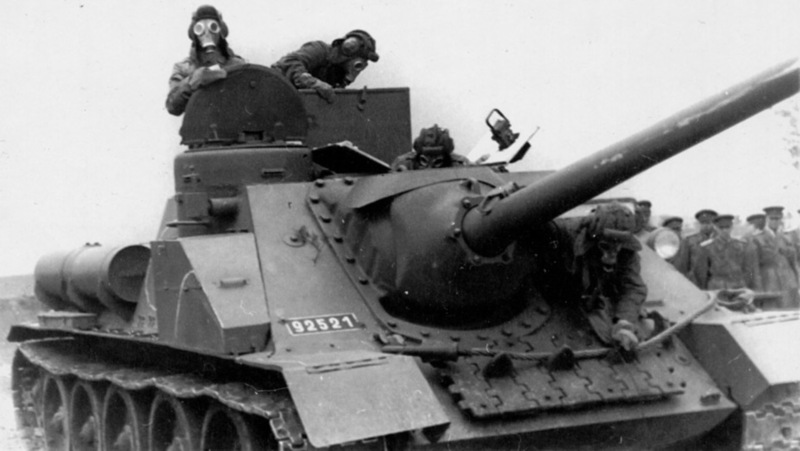 By June 1946, Czechoslovakian tank brigades consisted of a mix of Soviet, American, and British vehicles, as well as 25 LT-38 and 19 ST-I (the index given to the Jagdpanzer 38). The presence of a large variety of foreign vehicles was not idea, but there was no other choice. The vast majority of domestic designs were based on pre-war projects. For instance, Skoda's medium SPGs were based on the T-22 chassis, a further development of the pre-war Skoda S-II-c, otherwise known as the T-21. SU-100 on a parade in Kiev, May 1st 1949. 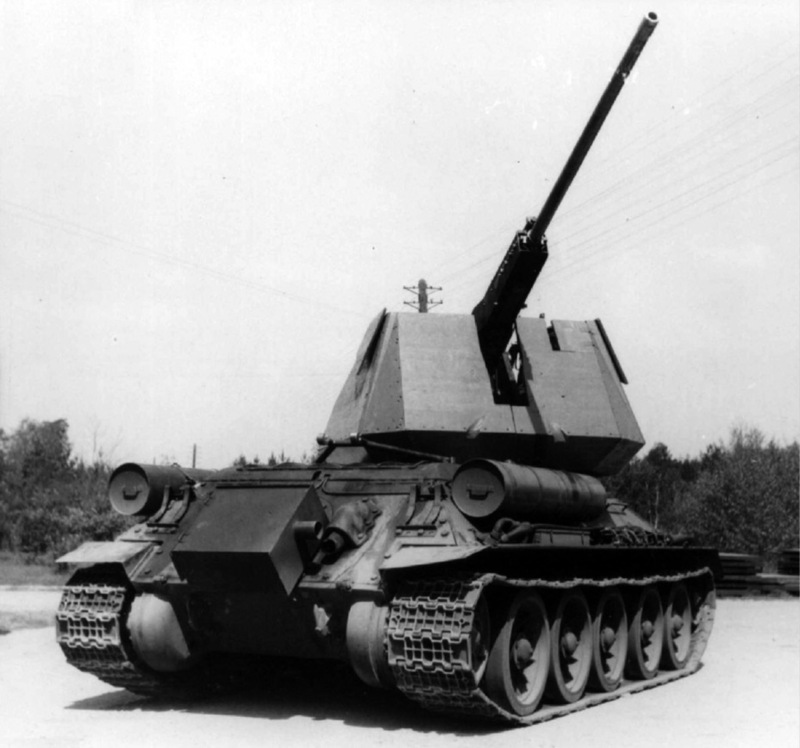 Despite a wealth of choices, Czechoslovakia only managed to mass produce this SPG. The development of the TVP (Tank všeobecného použití, main battle tank) was launched in the fall of 1945. This program was initially done by the VTU (Vojenský technický ústav, Military Technical Institute). Later, it was given to Skoda, which developed the T-40 project. Development continued as a joint project between Skoda and CKD. SPGs were developed as a part of this project starting in late 1948. According to the concept developed by the Czechoslovakian military, these would be mobile, thinly armoured SPGs with open turrets. 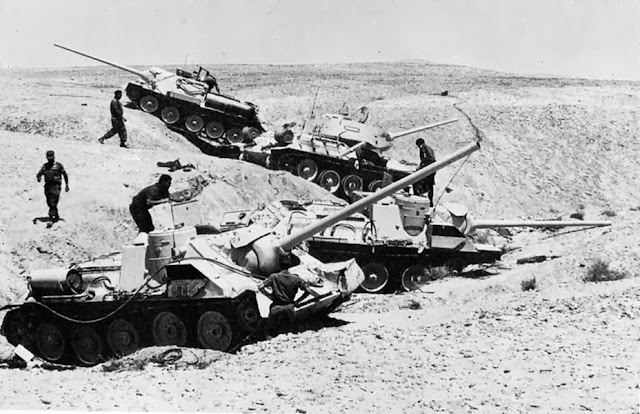 There were two of them: the 152 mm ShKH 43,5/675 TVP and 100 mm ShPTK 14,75/950-TVP, a self propelled howitzer and tank destroyer respectively. Two more vehicles were designed that did not have turrets, but had better protection: 152 mm ShKH 43,5/675 TVP and 100 mm ShPTK 14,75/900-TVP. Work was taking a long time, which had to have bothered the Czechoslovakian army somewhat. Repair and refurbishment of captured vehicles was chosen as a temporary measure. 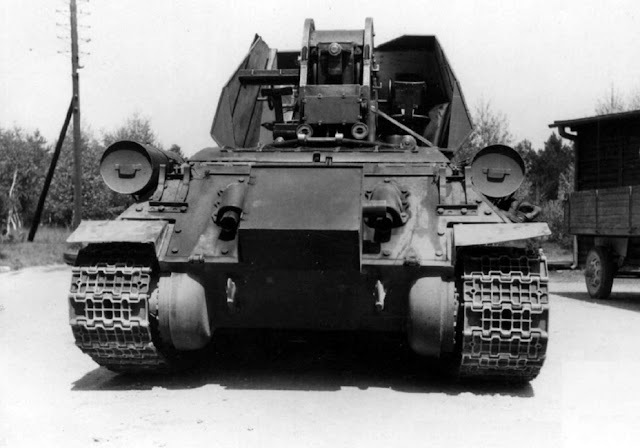 The Czechoslovakian army gained the ShPTK vz.40/75N (after 1949, SD 75/40N), built from the German StuG 40 Ausf.G. 124 of these vehicles were built. In addition, the Czechoslovakian army received 12 German Nashorn tank destroyers in 1949 under the index ShPTK vz.43N, as well as 20 ISU-152s under the index TSD 152/37S. 5 years passed since the end of the war, and not a single Czechoslovakian tank or SPG had been built even as a prototype. 100 mm R 11 AA gun that served as the basis for the A 20 anti-tank gun. This serious issue was only corrected by a foreign purchase. In July of 1949, Czechoslovakia bought a license to produce the Soviet T-34-85 medium tank. The plan was to replace it with the TVP tank, but work on that died in the spring of 1950. The T-34-85 was obsolete by then, but it was better to have a bird in the hand than two in the bush. The CKD Sokolovo locomotive factory in Prague was to build these tanks. Preparations began in January of 1950. Organization went quickly, and the first T-34-85 produced in Czechoslovakia was delivered in September of 1951. The death of the TVP meant that all SPGs on its chassis went with it. The solution was buying a license for building the SU-100. The lifespan of this vehicle was longer than that of the T-34-85. After the Ural Heavy Machinebuilding Factory (UZTM) finished building these vehicles, production started in 1947 at factory #174 in Omsk, and continued until 1948. This is what the SD-100 with an A 20 gun could have looked like. The SU-100 was also obsolete by the early 1950s, but the same chassis as the T-34-85 that was already in production made it easier an easier pill to swallow. The armament of the SU-100, the 100 mm D-10S gun, was still a viable weapon. However, at a meeting held on December 13-14th, 1950, it was decided to use a Czechoslovakian gun on the licensed SU-100. This could have been the A 20 anti-tank gun that was being designed by Skoda. This was a variant of the R 11 AA gun, which was also adapted for the TVP as the AK 1. At 1 kilometer the A 20 penetrated 140 mm of armour sloped at 30 degrees. This was better performance than the D-10S. The issue was that out of this trinity only the R 11 was ever built even as a prototype. There was no point in performing the conversion in these conditions. In addition, Czechoslovakia began receiving Soviet production SU-100s. 452 vehicles were transferred in total, indexed SD-100. 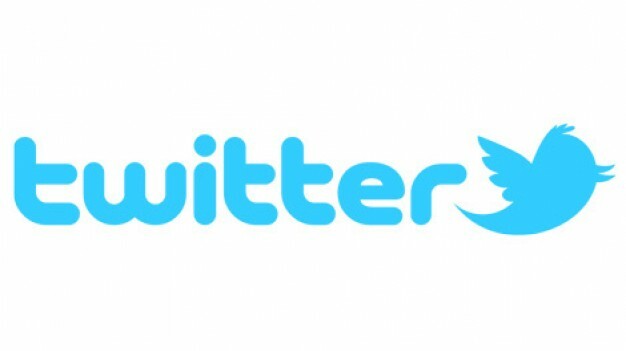 The license-built version received the same name. The final decision to purchase a license to produce the SU-100 was made in 1951. Production would take place at the same CKD Sokolovo. Hulls would be produced at the Stalin factory (Závod J.V.Stalina, or just ZJVS) in Martin, Slovakia. The SMZ locomotive factory in Slovakia (one of Skoda's factories at Dubnica nad Váhom) produced a licensed version of the D-10S under the index 100 mm SHK vz.44 S.
An SD-100 during exercises in the mid-50s. The vehicle has "Sverdlovsk style" tow hooks, but an "Omsk style" cupola. Organization of the SPG's production was delayed. It was first necessary to fill the tank forces with tanks, as the situation with SPGs was not as poor thanks to German and Soviet vehicles. 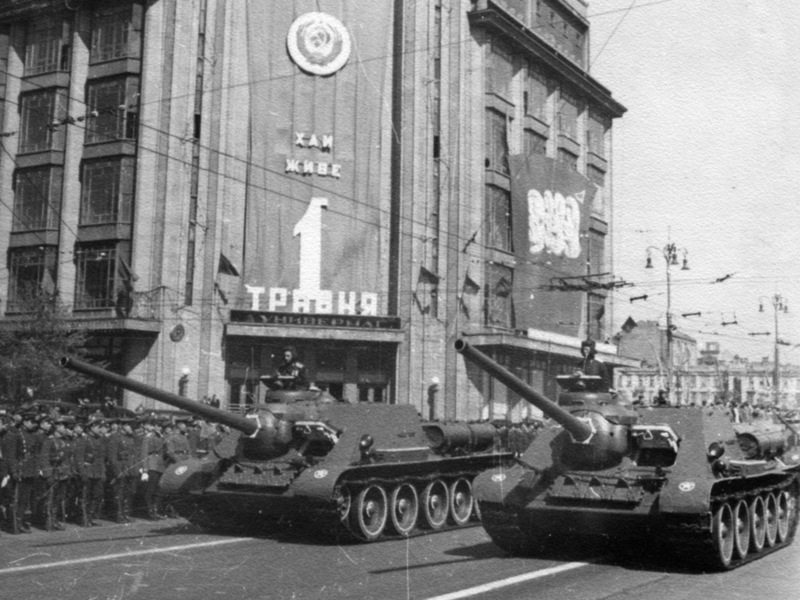 Since production of the T-34-85 was a higher priority, the first SD-100 was only delivered in 1953. Mass production was also slow. Only 129 SD-100 were built in Prague in 1953-54, while 951 T-34-85s were built. Production of the T-34-85 started two years earlier, but this is a significant difference. Production of tanks was moved to Martin in 1954. Final assembly and engine production was done in Czechia, but production of hulls and armament took place in Slovakia. Moving the production to Martin was a more logical solution that sped up production. 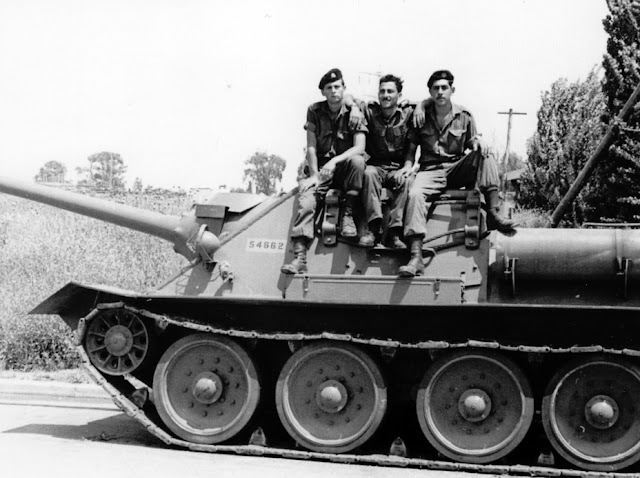 A captured SD-100 in Israel, 1957. The headlight has a distinctive guard. The Czechoslovakian SPG had a number of distinctive features. As mentioned above, the last factory to build the SU-100 in the USSR was factory #174. It was on their documentation that blueprints of the SD-100 were based. However, documentation on the T-34-85 came from factory #183 in Nizniy Tagil. Czechoslovakian designers put in their own contributions. The result was a mix of solutions, same as with the Czechoslovakian T-34-85. Even though the tank came from Nizhniy Tagil, the Czechoslovakian vehicles had a number of features that had to have originated in Omsk. The vehicles received Notek lights during service. Factory #174 developed their own tow hooks without a protrusion for affixing the eye of the tow cable. The Czechoslovakian version had a regular hook with the protrusion. At the same time, the upper rear plate of the SD-100 and Czechoslovakian T-34-85 had an Omsk design. The exhaust covers had the characteristic wave shape, and the hinges of the upper rear plate were unified with the round transmission access hatch hinge. Another purely Omsk solution is seen in the road wheels. The factory #174 hub caps had a characteristic shape, which can be seen on both the SD-100 and Czechoslovakian T-34-85. The track links of both vehicles also traced their roots to Omsk, as they had the perpendicular ribs. The quality of the armour casting was higher, and the edges of the armour plates had a better finish. There were also purely Czechoslovakian features. First of all, it was the very careful finish. 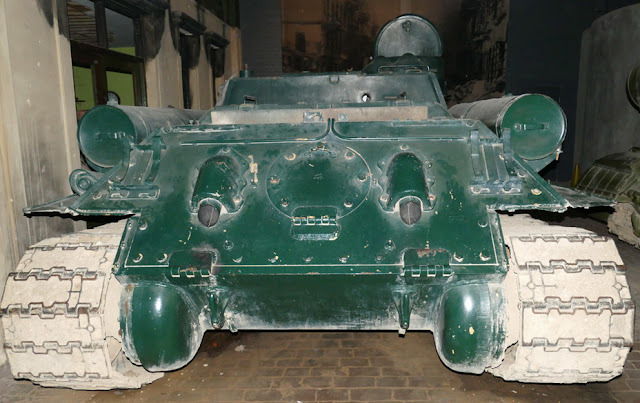 Soviet vehicles had very rough edges of the armour, especially the front plate. This is not surprising when you consider the conditions that Soviet tank builders worked in, and that the aesthetics had no effect on combat capability. However, hulls assembled in Martin were very built very carefully. The same went for the casting: there was no pitting or rough surfaces on Czechoslovakian production vehicles. 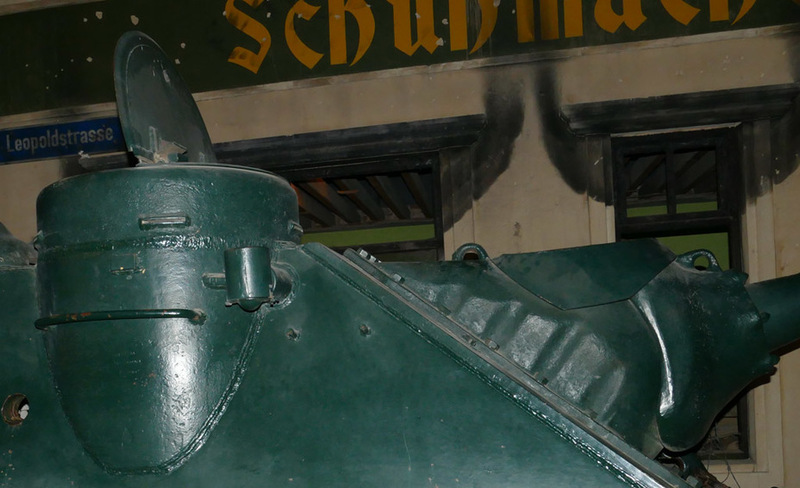 The cast side of the commander's cupola has a rectangular welded part, an Omsk feature. The same commander's cupola was also designed at factory #174. One part that gives away the Czechoslovakian origins is the telephone port for communicating with the crew located on the rear left of the hull. This port is also sometimes seen on Soviet vehicles that served in the Czechoslovakian army. The headlight also has a characteristic guard. These features are enough to distinguish between the Soviet SU-100 and Czechoslovakian SD-100. A characteristic rear section, the same as on the Czechoslovakian T-34-85. The telephone port, typical for Czechoslovakian tanks, is seen on the left. As in Prague, Martin's top priority was production of the T-34-85. Nevertheless, the difference was not as great as at CKD Sokolovo. 641 SD-100 and 1765 T-34-85 were built in Martin. The availability of the SD-100 and its more powerful gun gave designers the idea to re-arm the T-34-85. However, this idea did not move past paper. Even with the more powerful gun, the T-34-85 was obsolete. Production of the T-54 that had the same 100 mm gun began in 1957, and the T-34-85 was taken out of production in 1956. The licensed copy of the SU-100 was the only SPG on a tank chassis that was mass produced in Czechoslovakia after the war. 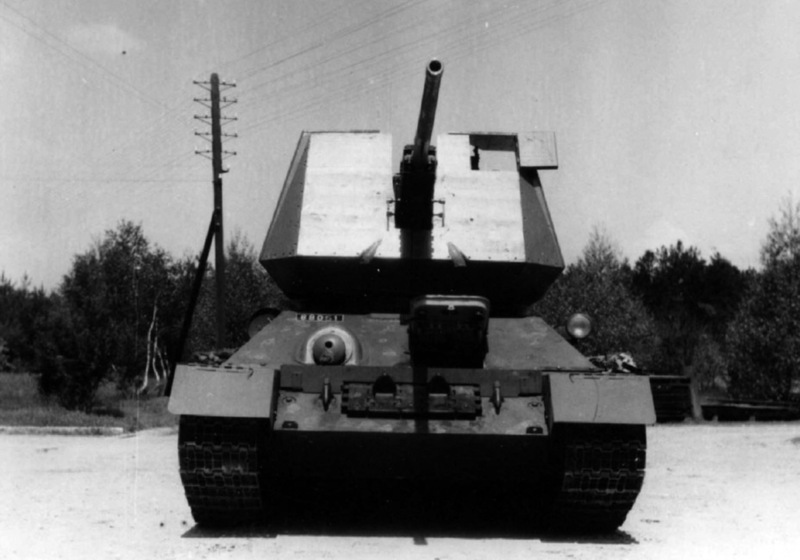 For a number of reasons, not a single SPG that was designed was ever produced, including others on the T-34-85 chassis. Skoda turned to development of AA guns, including autocannons, almost immediately after the war. Skoda designed a 50 mm AA gun meant for German use during WWII, and this design was developed further. The result was a 50 mm AA autocannon with German roots. The gun was finished in 1948, and was proposed for installation into the 50 mm ShPLK 2,12/1020-LP, a SPAAG on the reworked Skoda T-17 chassis. Neither the gun nor the chassis ever made it off paper. An experimental SPAAG on the T-34 chassis, 1953. The 57 mm R 8 AA gun entered trials in 1949. This was a reworked version of the same 50 mm AA gun. Like the previous design, it was based on German work. The gun was fed with 3 round clips. The ammunition of the R 8 was different from Soviet 57 mm ammunition. The R 10 AA gun with a mount similar to the 40 mm Bofors appeared later. Development took a long time, and the gun was only accepted in 1956. The weapon was comparable to the Soviet S-60, superior in some ways and inferior in others. 220 R 10 guns were built, and the army bought S-60 guns as well. 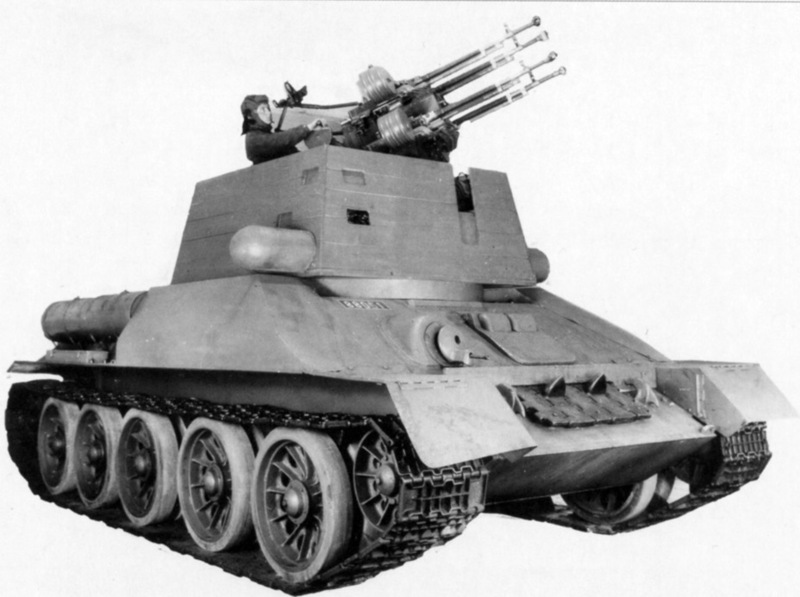 This was the only success of Czechoslovakian designers in the field of medium AA guns. 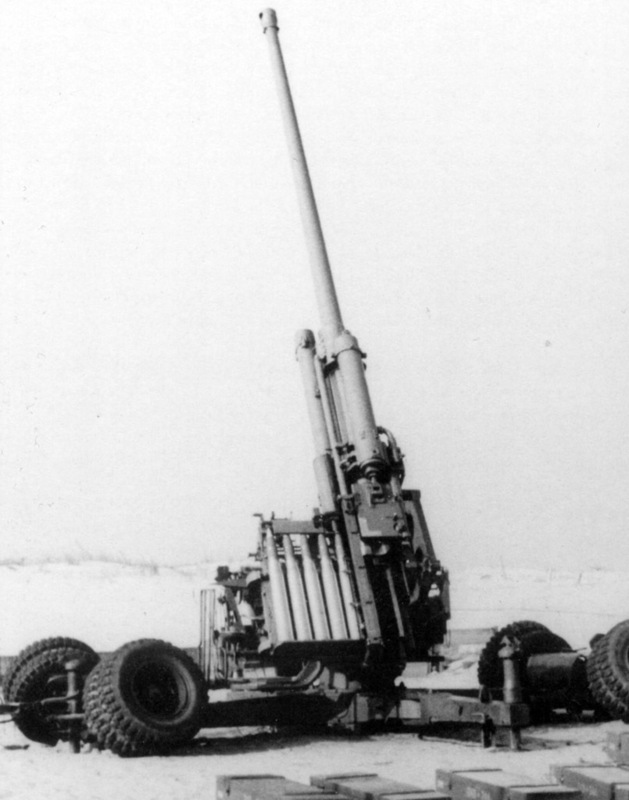 Larger AA guns developed by Skoda were never put into production. The turret on the model was made of plywood. The issue of building a SPAAG was raised once more during development of the R 10. Due to the death of the Skoda T-17 and T 50 projects, the T-34-85 remained the only available chassis. 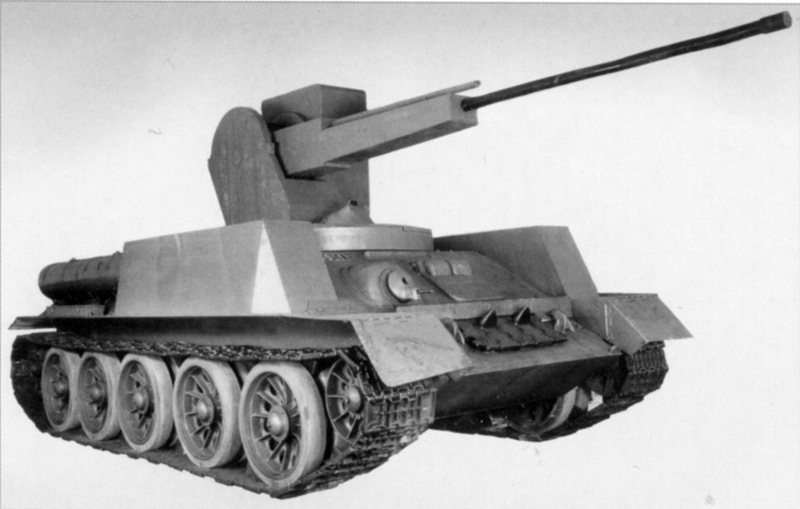 VTU received an order to develop a SPAAG using the T-34-85 chassis and R 10 AA gun on September 19th, 1952. In addition to airborne targets, the weapon was also meant to combat lightly armoured vehicles. Having studied foreign experience, the VTU decided to build a tank similar to the British Crusader AA, Swedish Landsverk Anti, or the Hungarian derivative Nimrod. This made the task simpler, since this meant there was no need to install a large platform or seriously change the chassis of the T-34-85. The turret was too small for a crew of 4. The mass of the SPAAG had to stay under the weight of the T-34-8. The difficulty was in that the military needed the front of the turret to protect from low caliber artillery. The gun crew also consisted of 4 men (two gunners, the commander, and a loader). As a result, it was not possible to meet all requirements. The mass of the T-34-85 turret with the gun, ammunition, and crew was 7820 kg. The AA turret weighed 8400 kg. The turret was open from the rear and the top. The front armour was 40 mm thick, and the sides were 20 mm thick. However, the prototype was assembled from plywood. The results of the trials, which lasted from March to July of 1953, were poor. The turret was too cramped, and the very idea of using the R 10 as the armament of the SPAAG with minimal changes was a mistake. The turret was also too tall. Work on this topic ended on August 29th, 1953. The Brno design bureau designed its own SPAAG in 1955, produced only as a full size model. The improved R 12 was used instead of the R 10. The turret of the LP-157 was unmanned. The ammunition was held in a bin to the left of the gun, and the crew (two gunners and the commander) were below it. This reduced the size and mass. A two-barrel variant named LP-257 was also developed. A scale model of this vehicle was also built. However, the R 12 still needed to be built, and the time of the T-34-85 was coming to an end. Work on a SPAAG on the T-34-85 chassis ended. The ZSU-57-2 was never adopted by the Czechoslovakian army. The four wheeled Praga PLDvK vz. 53/59 built on the V3S truck chassis was simpler and cheaper. Self propelled LV-157 rangefinder for aiming the LP-157. The last Czechoslovakian vehicle on the T-34-85 chassis was a mobile AA gun ranging device. This vehicle was also developed in Brno for coordinating LV-157 fire. Essentially, this was a self propelled rangefinder that was armed with a quad DShK mount. Work did not progress past a full size model on the same chassis as the LP-157. Since the LP-157 and LP-257 were cancelled, there was no need for a rangefinder for them. The appearance of the SD-100 and SU-100 was a means of dealing with the T-34-85's weak armament. SPGs began arriving in tank regiments in 1953. The 85 mm S-53 could no longer combat all types of enemy tanks, and the SPGs were used to reinforce them. The number of SD-100s was a much as a third of a tank regiment. Tanks that were replaced with the SD-100 were sent into storage. Czechoslovakian tank regiments remained mixed until 1960. The T-34-85 and SD-100 were gradually replaced with the T-54, which had a 100 mm gun in a turret, plus more serious protection. The SD-100 were now sent into storage. In addition, they were actively marketed to foreign buyers. After the SD-100 were taken out of tank regiments, they served as training tanks until the mid-70s. Many of these vehicles were preserved in Czechia and Slovakia. The SD-100 plays the role of a T-34-85 in many public and private collections. The story is similar to the one with the G-13, but while the G-13 was at least built from Jagdpanzer 38 hulls, the SD-100 was built in Czechoslovakia from scratch, and in the mid-50s to boot. It is not the best idea to market this SPG as a SU-100. However, some museums and collectors buy these are Soviet wartime production vehicles. These kinds of frauds are not rare: museums in Munster, Sinsheim, La Wantzenau, and many others have an SD-100 on display and not a SU-100. An SD-100 on parade in Cairo, 1957. The signs of a Czechoslovakian production vehicle are clearly seen. In total, the Czechoslovakian army received 460 SD-100s out of 770 built. The others were built for export. On March 21st, 1953, the deceased Klement Gottwald was replaced by Antonín Zápotocký. Under him, Czechoslovakia once more became an active seller on the arms market. Sales began in 1953, and tanks were among the items on offer. One of the first buyers was Egypt, which started receiving SD-100s in 1955. 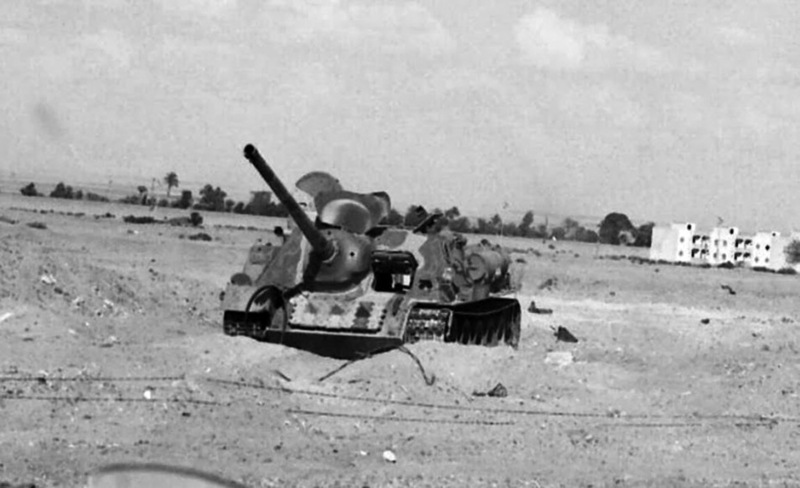 It was Czechoslovakian SPGs that were used in battle against Israel, Britain, and France during the Suez conflict in 1956. The SD-100 in Bovington, Duxford, and Saumur are trophies from this war. In total, Egypt received 148 SD-100s. Israeli trophies of the Six Day War, 1967. Syria bought 38 SD-100s. These SPGs fought in the Six Day War alongside Egyptian ones. The IDF ended up seriously boosting its collection of trophies: 100% of SU-100s in Israeli museums are actually captured SD-100s. The Yom Kippur War was the last to see widespread use of the SD-100. The shipments from Czechoslovakia became mixed some time later. A significant percentage of the vehicles was composed of Soviet stock. Sometimes Czechoslovakia merely acted as an intermediary between the USSR and other nations. 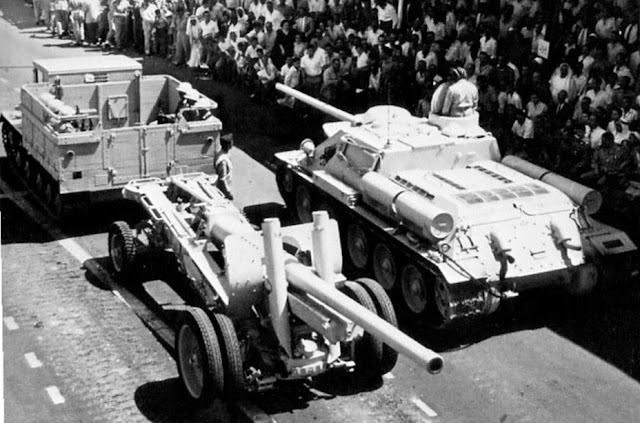 For instance, Cuba received 50 SU-100s from Czechoslovakia, but these were actually Soviet vehicles. The 50 SU-100s in Yemen were in the same boat. The vehicles sent there were clearly Soviet production. Bulgaria, Romania, Ethiopia, and Morocco also received SD-100s. One can confidently say that the Czechoslovakian military made the right choice with the SD-100. Even though they did not manage to design their own tank, it was possible to arm the army using a licensed design. Thanks to exports, Czechoslovakia managed to make a mint. The country was back on the arms market, even if it was with a foreign product. "At 1 kilometer the A 20 penetrated 140 mm of armour sloped at 30 degrees. This was better performance than the D-10S." This is equivalent to the 100mm D-10S with the BR-412D round.